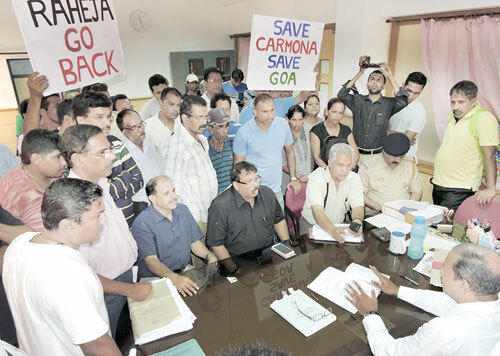 MARGAO: Benaulim MLA Caetano (Caitu) Silva and Carmona locals have demanded the revocation of Rahejas’ construction license at a meeting with senior town planner James Matthew in Margao on Monday. The town planner agreed to inspect the project site next week after he was given evidence that a cross, which had not been shown in the property documents, existed on the property. Silva conveyed his objections to the senior town planner and submitted his written objections and memorandum of the village committee to the chief minister’s office, deputy chief minister’s office, Town and Country Planning (TCP) department, director of panchayat and other departments in Panjim later in the day. Drama unfolded in the village a little after midnight on Monday as locals learnt that Rahejas was sending its machinery from Maharashtra to Carmona. The locals sat on the roads and maintained a vigil until 4 am, with the aim of not allowing any machinery to enter the village. At 10 am, a large number of sleep-deprived villagers, who also held placards, met Matthew in the presence of police officials and Silva. At the meeting, Carmona Village Committee (CVC) spokesperson Socorro Miranda conveyed their objections to the construction license and the technical clearance given by the panchayat and TCP respectively. Silva also submitted a complaint to the TCP and supported the arguments of the people, who felt that the TCP had erred in giving technical clearances based on issues like no sanad, no process access, FAR manipulation, etc. They also informed that a local panch had raised objections regarding the width of the road during the site inspection and pointed out that the panchayat had granted the license while ignoring these objections. Mathew said he needed time to study the matter and explained the laws and technicalities involved in granting permissions to Rahejas. CVC president Blair Rodrigues emphasized that the project would spell doom for the village. While Mathew stated that his office was empowered to check if there were any violations regarding the access and property documents, he expressed surprise when told about the existence of the cross. The locals criticised the panchayat for failing to check these objections and explained in detail how the panchayat had bypassed the people when issuing the construction license. They informed the TCP that they had documents to back their arguments and would be going to the court with the same. The locals also warned that there were unconfirmed reports that Rahejas would be bringing in machinery. They warned that the authorities should act at the earliest as the locals would not allow the trucks to enter the village. The locals also warned of a law and order situation in Carmona if the trucks arrive. The villagers further questioned how technical permission could have been given on the size of the road and how two cars could not move on the road. They also questioned the logic behind the amendment to rules that were not in the interest of the locals. The discussions were peaceful, and it helped both groups explain their points of view. While Mathew took down the phone numbers of CVC members to confirm the time of the inspection, locals recalled various objections regarding the proposed size of the roads for the regional plan. They explained that in the Raheja plot, any expansion of the road would lead to the encroachment of residential property and compound walls. Silva also extended his support to the people and expressed shock at the recent turn of events. He promised to follow up the matter with the authorities, while the villagers said they would follow up the matter with other departments as well. Raheja is proposing to build 88 residential units in the village in a plot it had purchased some years ago.